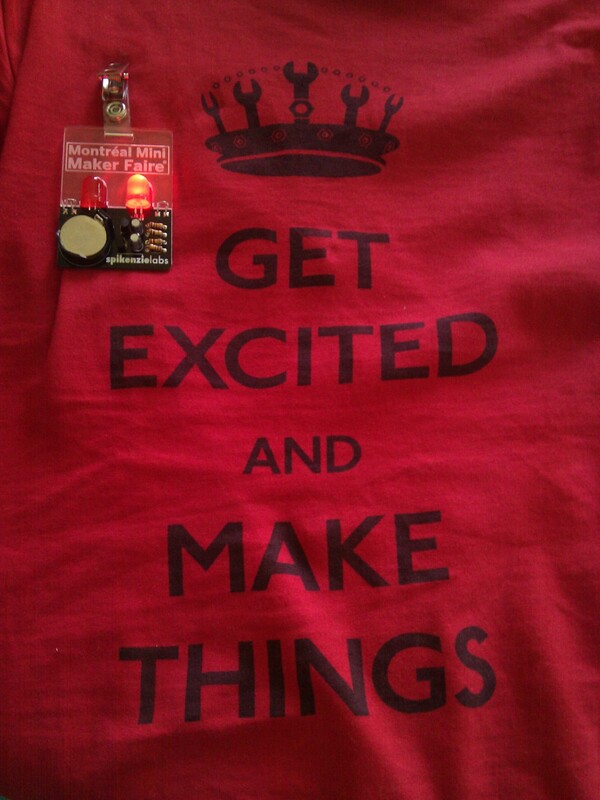 The best thing I did at the inaugural Montreal Mini Maker Faire last weekend was solder my very own LED pin. Ben didn’t want to go anywhere near that soldering iron, and I’m glad I didn’t cajole him into it. He has wonky fine motor skills and I burned myself at least once. A simple little flashing pin took me half an hour, after I’d fixed up all the goopy metal. And even then I kind of got it wrong (I slotted one of the conductors backwards). Still, getting a concrete sense of the labor that goes into making stuff we throw away without thinking, has really been an eye opener. As was sitting around a table with a group of first world mothers and their daughters, and thinking of all the families around the world that actually do this all day for a living. A sobering thought. 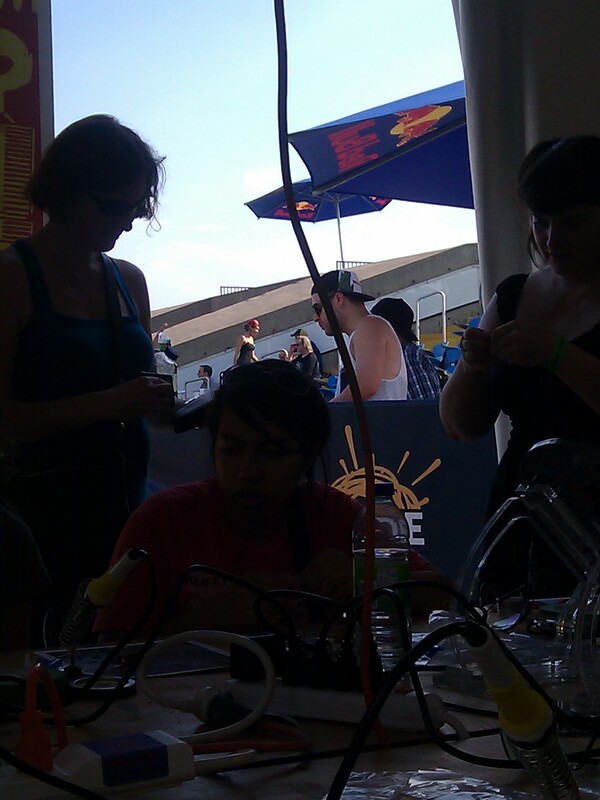 Good thing there was a bar right next to the soldering tent. Kidding. I don’t drink and solder. But there was a bar. 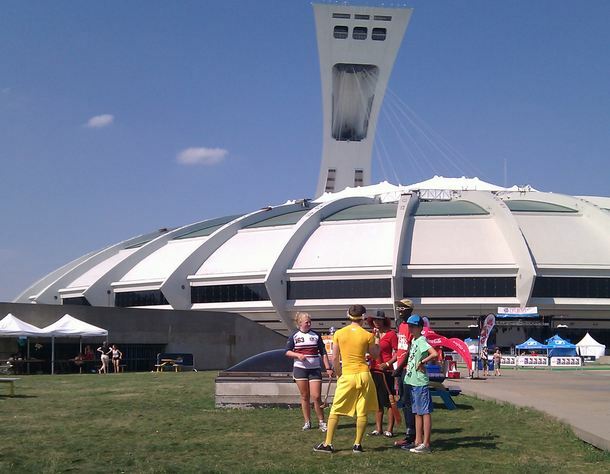 Our Montreal Maker Faire was an afternoon event that preceded a music festival at the Olympic Stadium. We overlapped by a couple of hours. The main tent had some very cool exhibits. Videogames hacked in all kinds of bizarro ways, hooked up to playdough, skin sensors and voice sensors. 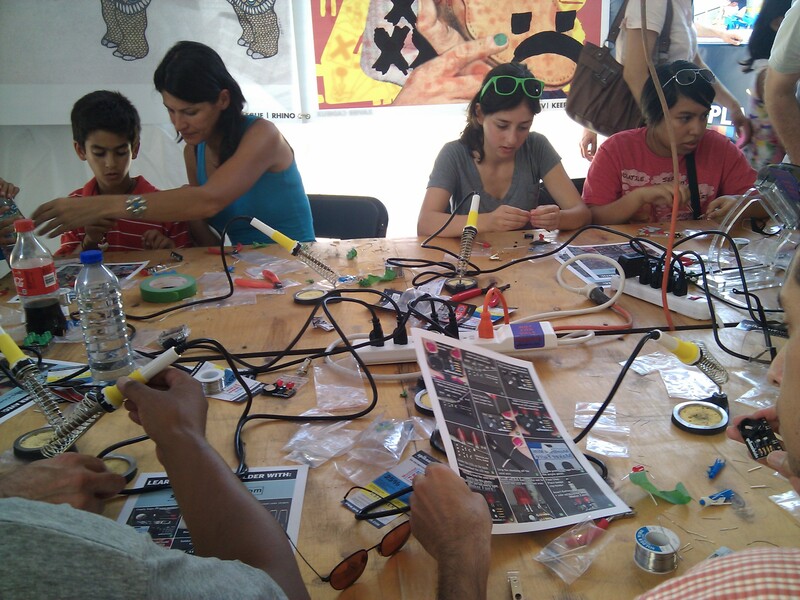 There was the usual array of 3D printers, eggbots, steampunk, robots and innovative DIY toys. 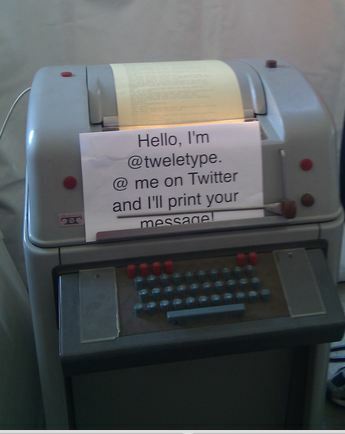 I liked tweletype, an old fashioned teletype machine hooked up to twitter. On the upper level there were quadracopters, camera obscura, home made bikes, and the Concordia women’s engineering department reconstructed a replica of the brooklyn bridge out of K’Nex. The game ends when someone grabs the tennis ball from his tail. 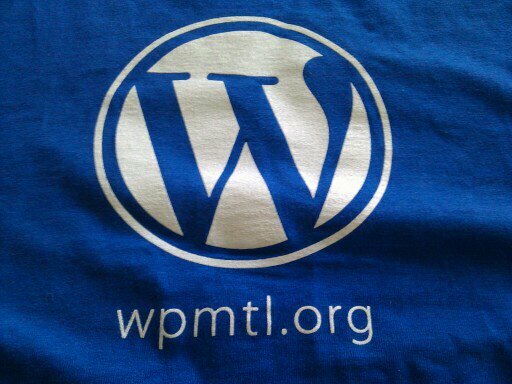 This weekend I went to WordCamp here in Montreal. I didn’t go to both days because Saturday was Ben’s birthday. It had occurred to me, when I first heard about this gathering of the wordpress community, to see if I could sneak off in the afternoon. But then, over at SkillCrush, I read these wise words from an experienced lady programmer: nothing is ever important enough to miss your child’s birthday. We had a great day on Saturday, hanging out, playing Little Big Planet and video game shopping. Sunday morning when I headed off to WordCamp, bright and early, I was brimming with healthy ambition. When I saw the number of people struggling through hangovers from the Saturday night social, I had no regrets. Hangovers notwithstanding, the energy at WordPress camp is so warm and nurturing and fun, I vow to make this a yearly ritual. And hopefully next year it won’t conflict with another one. Responsive Design (how to design your web pages so that they fit mobile devices, as well as desktops). Lots of technical stuff that I mostly understood and will probably better understand next year. The takeaway: code semantically. i.e. start learning now how to design webpages that are low on marginalia. 100% column widths. Sliding panels. etc. Child Themes. You don’t actually have to know much CSS to build really cool websites. There’s basically a separate console that allows you to write just a little CSS and dramatically tweak the core code. The CSS for the child theme will always override the CSS for the parent theme (not unlike life.) The takeaway: don’t ever touch the core code! Use the separate console for child CSS. This could be a really cool project for kids, learning just enough CSS to mash their own cool website designs from available themes. At lunch I had a great chat with the developer who has adapted Word Press for Post Media, one of the largest media conglomerates in Canada (National Post, Montreal Gazette). One of the things he pointed out is how little envy there seemed to be at WordPress camps. Unlike other conferences where networking always has a kind of edge, there’s so much work these days for developers, the vibe is open and generous. In the afternoon I went to presentations that were a little more local, content oriented, and French, so I won’t summarize them here. But at the end of the day I was so impressed with the whole WordPress organization that I found myself trawling through their job postings. The one that caught my eye, Happiness Engineer. What an awesome job title. If I understand the job correctly, it’s enlightened customer support. Requirements are good writing skills, a working knowledge of HTML/CSS, and compassion for people grappling with information technology. Maybe I’ll apply. But in the meantime, I have my own little startup here at familycoding, and the job of Happiness Engineer has just been filled. Yesterday we took a break from python and had some fun with the “x-ray goggles” at Mozilla’s Hackasaurus. This is a great little tool that helps kids learn HTML and CSS by allowing them to mess with what they see in their browser. X-ray goggles allow you to scan the different sections of the page, see the HTML/CSS code, and change it right there on the page. 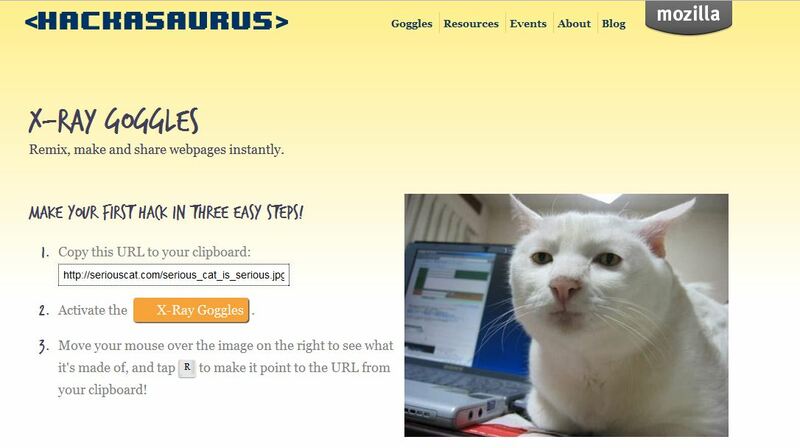 The first exercise is to download the url for a “Serious Cat” picture and change the girl for the cat. Once you’ve done your first hack, you can drop the goggles into your bookmark bar and head out onto the web and mess with other websites. 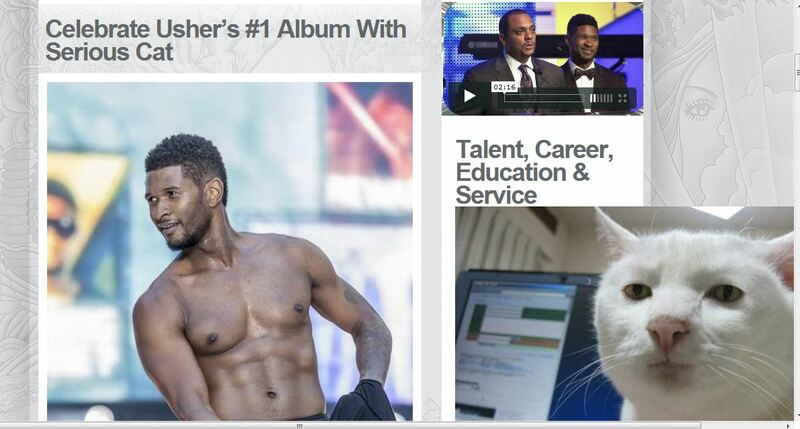 I thought Usher could use a little serious cat treatment. Fortunately only what’s in the browser gets altered. The actual website is safe. 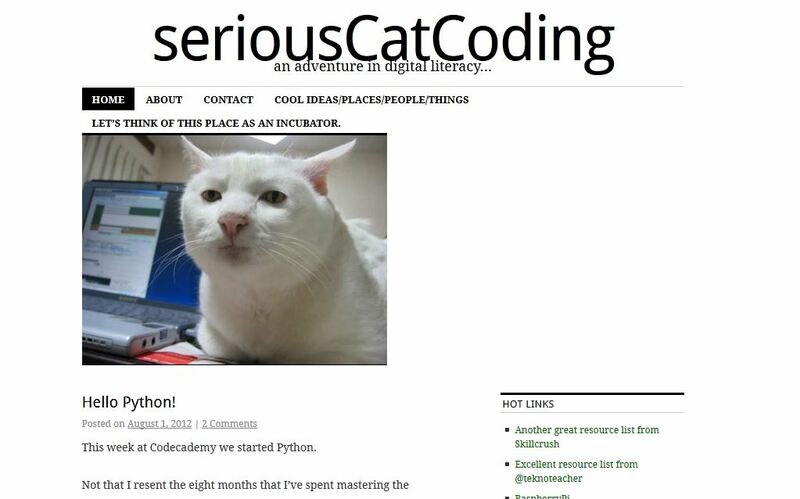 Imagine a web where cats could learn to code….that could get serious. This week at Codecademy we started Python. First off, where is the crazy making syntax! Oh, those first weeks of JS, where every rule was such an affront to my sensibilities as a writer. Semi-colon over use. Periods in the middle words. Capitalization of second words. In the early days, my brain rejected JS like it was a kidney of the wrong blood type. Python is made for writers and I’m guessing much better made for families. It’s also made for people with a sense of humour. The name of the language comes from Monty Python, which makes it particularly appropriate for my family. My mother went to Oxford, and was once in a skit with Peter Cook and Dudley Moore. Bragging over. She played the American girl with a nice rack. Still, British comedy was pretty much a side dish at dinner where I grew up. Python tutorials are known for their cultish flourishes, and use “spam” and ” eggs” as introductory variables. Over at Skillcrush, (an exceptional ed tech startup directed particularly at women), I recently learned that Python is used for sites like Youtube, reddit, and Yelp.